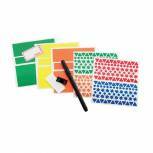 Q-Connect Planner Stickers Kit (50 labels per A6 sheet) KFKK Pack of 1 Q Planner Kit. Contains one Black drywipe pen and four self adhesive A6 sheets in assorted colours. Each sheets contains an assortment of shapes. 50 shapes per A6 label. Sasco Aluminium Mounted Planner Track (Pack of 2) 20360 Pack of 1 Sasco Wall Mounting Tracking. The ideal product to fix mounted planners to the wall. Supplied complete with screws and wall plugs and suitable for use with all mounted planners W915xH610mm. 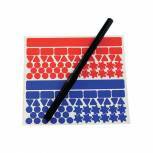 Sasco Year Planner Stickers Kit (for use with Sasco Planners) 70080 Pack of 1 Accessory kit for use with Sasco Planners. Provides additional room for extra information. Helps to highlight important dates. Perfect for use in the office. Can be used with all Sasco planners. Includes a reusable Today is sticker.